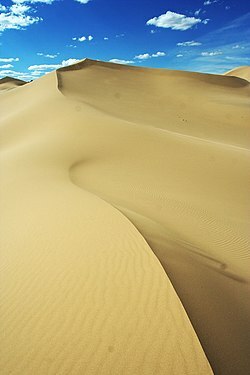 Gobi Gurvan Saikhan National Park is in Mongolia. Entrance fees to national parks and protected areas are 3000 ₮ or US$3 for one person. It is paid one time when you enter. Museums at the Yol Canyon ticket cost 1000 ₮. The only option to get around is by hired jeep. Some souvenir shops are located in front of the museums, and monastery. Gobi, Umnugobi Aimag (Dalanzadgad), ☎ +976 91109109. Nomad camp US$10. This park travel guide to Gobi Gurvan Saikhan National Park is an outline and needs more content. It has a template, but there is not enough information present. Please plunge forward and help it grow!